HE02EIXP HDMI CAT5 Extender is using only one cost effective CAT5e/6 cable to extend 4K UHD 60Hz 4:4:4 display up to 70m. Fully compliant with HDCP, EDID and CEC control. Built-in bi-directional simultaneous IR/RS232 transmission to allow extend the remote control either source or/display side. With supports PoH (Power over HDBaseT) feature which eliminating excess or unwanted power drain and also provides power to the receiver at the remote location. 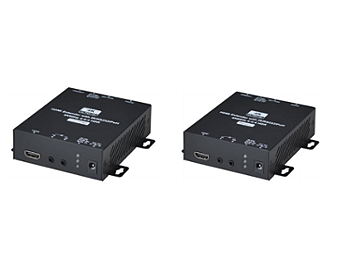 Extends HDMI 4K UHD, IR/RS232 signal and Power over one CAT5e/6 cable. HDMI 2.0, HDCP 2.2/1.4 & DVI Compliant. Support 4K UHD capability@60Hz with 4:4:4, HDR. Support 1080p@60Hz@48bits at 70m, 4K@60hz at 40m.